F l o a t i n g.
Humidity envelops you, like a blanket. and proboscises prick awaiting flowers. Flit away before kids like you prod at the petals. 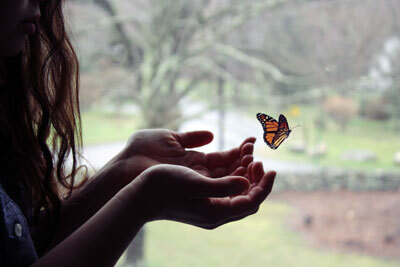 as a butterfly sticks to overhead glass. There! One flees from the flock. as it drifts down, down, down. Old eyes watch as it comes straight for you. Tiny legs rest on the tip of your frail finger. With a sudden flicker, it’s gone.